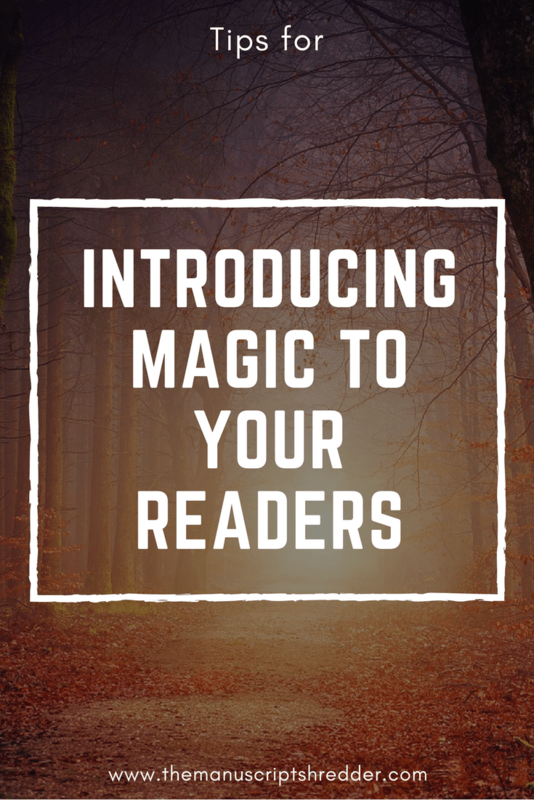 Introducing your readers to your magic system takes careful consideration. Don’t blindside them with the supernatural. Prepare them properly, and they will be ready to believe anything. A few years ago a young writer handed me her baby book and asked for some feedback. Since this was her first novel and a NaNo child, I had no idea what to expect when I clicked on the link. From the first sentence I was immersed into a poignant modern tragedy of a woman struggling with not only the pain of infertility but also the need to justify her value as a woman against her religion’s explanation for her existence. The writing was beautiful, painful, and truthful. By the end of the first chapter, I was hooked. And then a tree knocked on the door. Yes, you read that right, a walking, talking, tree. All the preparation from the first chapter dissipated in one line. I was left dumbfounded. After that moment the writing completely fell apart. Whatever beauty had been grown in the first chapter, the second one killed it. Clearly there are times (in magical realism especially) where the MC will be surprised to find that things in the world are not exactly as they seem. “iZombie,” “Sleepy Hollow,” and “Once Upon a Time” are three examples of shows where magic exists secretly in the contemporary world. In all these shows, the MC begins in the ordinary world but soon discovers the magical one. So why does it work in these shows and this particular MS fell short? The original story failed because it did nothing to prepare the reader for the supernatural. Instead the author set the reader up for an entirely different story, (one about infertility and religious repression) so when the supernatural element arrived, the reader felt blindsided and ultimately betrayed. Establish normal then violate it. The first job of any storyteller is to establish normal. This is the second function of your opening, (behind introducing your MC) Take the opportunity to establish that normal, perhaps really isn’t. 1. Over emphasize character’s denial of strange. In the first chapter of Harry Potter, Rowling emphasizes repeatedly that Mr. Dursley “never has anything to do with any funny business.” She goes to so much trouble to make certain that everyone knows this, that we are all guaranteed to make the opposite assumption. We are so grounded in this assumption that by the time Mr. Dursley begins to see people dressed as wizards we know exactly what is going on. Another technique is to show the supernatural element right away in a prologue, then introduce your MC. This technique is used much more frequently in TV and film, but can also be used in novels. However, since prologues are currently out of fashion in books, proceed with caution. Also, if your story is single 1st-person POV, having one scene from the monster’s POV could be jarring to the readers. A third possibility is to introduce the supernatural element in small doses. A few dashes of “What was that? and “That was strange.” will prepare your audience for the bombshell. Tone will help these little seeds take hold. A glimpse of a ghost will feel more appropriate with darker prose. The exact opposite of little hints is to start with the supernatural, and then establish normal through his/her reaction to the event. This means that your main character will be introduced to the supernatural on or near the first page. These are only a few ideas, but should give you a place to start. Whichever technique you decide, do not wait until the second chapter to start preparing the reader. Preparation (some hint of a magical world) must begin in the opening pages, otherwise, your readers will feel confused or blindsided. Once you have established normal and introduced your supernatural element, don’t forget to have your characters react in a meaningful way. In the tree story, our MC invited the tree into her house and sat quietly while it talked to her for what I could only assume was the better part of an afternoon. The author gave the reason the MC just sat there and let the tree chatter away as “she was stunned.” The real reason seemed more likely that the author needed the tree to dump some backstory. In any case, it was neither believable nor effective storytelling. This is the first gut response to something. If the MC is stunned, fine, but a knee jerk reaction is the one the MC makes without thinking. After a few seconds, or perhaps a minute, the MC’s brain will begin to work again. Time to move on. After the shock has worn off, it’s time to start thinking. While the tree was chartering away, the MC could have been sliding across the far wall, mentally calculating the number of steps between her and the shotgun, trying to remember if the bullets were still locked up. Something. A more timid MC might be planning some means of escape or even cowering in terror. Make sure the reaction matches the characterization you built in your opening. Once the encounter is over, the MC will have to spend some time digesting the new information and integrating it into a new world view. Do not ignore this important element. Not only will this enrich your character arc, but it will make the encounter feel more believable. Even someone who has believed in ghosts their entire life with have to process the experience of finally seeing one. There is a difference between believing and knowing. Make certain the tone of your opening matches with the rest of the book. The tree book began with a somber women’s fiction feel and in the second chapter changed into a contemporary paranormal adventure. These are completely different genres making the chapters feel as if they had come from two different books. Introducing the paranormal should change the life of your main character, not the tone of the manuscript. Take the time to prepare your readers. Lead them through your character’s discovery and response, then they too, will believe in magic. So true! I had a magic world, but I didn’t show any of the mainstream magic, just the secret magic! I had to go back and integrate it into the world, so we’d be set up and ready for it, when my main character started playing with it. Good advice. I write books set in the future and need to make sure the reader knows how the characters arrived, else the stories make little sense. Overemphasis is an interesting one. I think most of the others are fairly common, but I don’t see overemphasis of the “normal” too often. I think your 3 part (knee jerk, initial plan, aftermath) is a good model for how characters react, if their reaction is surprise, but, in addition to characters who “know” and “are not surprised”, there are also those who, for whatever reason, don’t react. The most common might be indifference. I’ve seen a fair number of stories where supernatural beings appear before a character, but, because of other concerns, or their general personality, they don’t react with shock or surprise, and it completely throws the supernatural beings off their game. I definitely agree that a story needs to sample all of its tones, and establish the overall rules/conventions of the diegetic world, early on. I think your example of Harry Potter really demonstrates how, while audiences don’t know all the details, they need to have a rough idea of what’s possible. Great post, and great example! Very interesting post. Thanks for sharing with us. It always helps to see writing from another author’s point of view. Making the magic logical in your story is important to help the reader believe in it. There needs to be reasons that things happen as they do in your magical world building. Thanks for sharing this insight with Author Toolbox. Thanks for this post! I’m not a reader who enjoys magic. I believe it’s because the author didn’t do what you suggest. I wasn’t prepared for it and it seemed either contrived or “not fair.” One book I read handled this well however. That was Jodi Picoult’s Leaving Time. That was an amazing story. She foreshadowed beautifully and didn’t make me feel cheated. Thanks for this good post that I wish other fantasy writers would read! Great post. When I write stories with the supernatural, I like to start it with a bang, so there’s no surprises. Hinting at it is also a good one. I’ve done that before with magical characters. You are so right. The first pages must set the tone and indicate whether or not the supernatural will occur. If you veer to far from a reader’s expectations you will lose them. Although, I think the MC would go for an ax or chainsaw rather than a shotgun. 😉 Thanks for this great post! Ah! Such a fantastic post! I’m having a big lightbulb moment right now, and it isn’t wearing off. 🙂 Thanks! And thank you for the walking, talking tree story. It made me laugh. This is a great tips! Sometimes us, writer, especially fantasy writer, just want to add magic and all supernatural things, but forget that there is must be something call “normal” in their book’s world. In my book, i want to make the residents of the world is normal with magic, but my MC is still new to it because his whole life his magic was suppressed. Do you think it’s possible to make it happen? As long as you are skillful with the set-up, a reader will believe anything. Just make sure you explain everything clearly and don’t leave any logic gaps. Good Luck! Hi, if you don’t mind would you be able to read the prologue in my story?